Tradescantia pallida, more commonly known as the “Wandering Jew” is a species of spiderwort that commonly adorns domestic interiors and ornamental gardens. 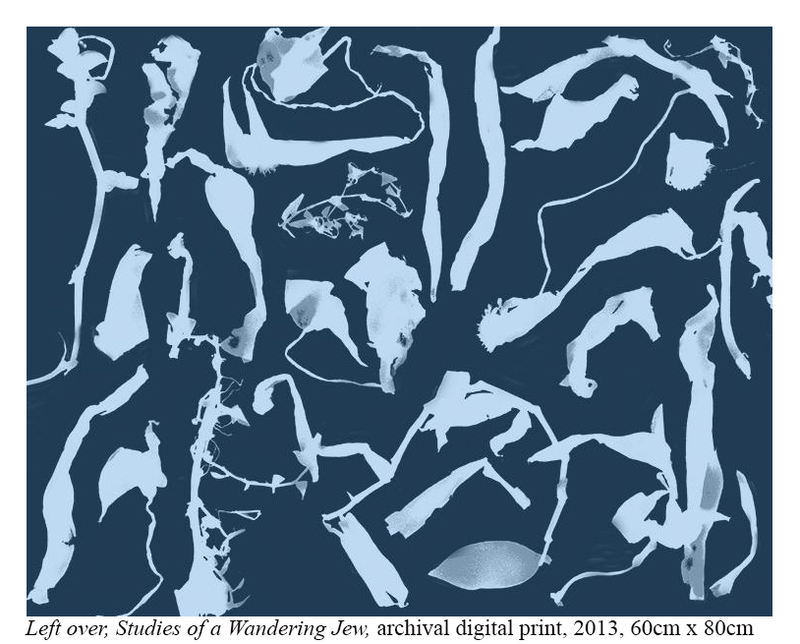 Studies of a Garden – A Wandering Jew seeks to explore the cultural meanings layered on the domestic plant by visually isolating it from its everyday contexts and recontextualizing it in two different ways. First, a series of digital prints. These still images were created by combining two photographic modes, neither of which require a camera – the photogram and digital image manipulation. The second part is a single-channel video work entitled Habitat, which follows the artist on her own wanderings (with the Wandering Jew) around Vilnius, Lithuania. The soundtrack for the video was originally written as the soundtrack of the film The Dybbuk, 1937, Warsaw. It was written by Henoch Kon (1890–1972) a Polish Jewish composer who was a member of Jewish Warsaw artistic circle between the Two World Wars and died almost anonymously in NY.